We’d love your help. Let us know what’s wrong with this preview of The Wandering Falcon by Jamil Ahmad. A haunting literary debut set in the forbidding remote tribal areas of Pakistan and Afghanistan. Traditions that have lasted for centuries, both brutal and beautiful, create a rigid structure for life in the wild, astonishing place where Iran, Pakistan, and Afghanistan meet—the Federally Administered Tribal Lands (FATA). It is a formidable world and the people who live ther A haunting literary debut set in the forbidding remote tribal areas of Pakistan and Afghanistan. Traditions that have lasted for centuries, both brutal and beautiful, create a rigid structure for life in the wild, astonishing place where Iran, Pakistan, and Afghanistan meet—the Federally Administered Tribal Lands (FATA). It is a formidable world and the people who live there are constantly subjected to extremes—both of geography and of culture. The Wandering Falcon begins with a young couple, refugees from their tribe, who have traveled to the middle of nowhere to escape the cruel punishments meted upon those who transgress the boundaries of marriage and family. Their son, Tor Baz, descended from both chiefs and outlaws, becomes “The Wandering Falcon,” a character who travels throughout the tribes, over the mountains and the plains, in the towns and tents that comprise the homes of the tribal people. The media today speak about this unimaginably remote region, a geopolitical hotbed of conspiracies, drone attacks, and conflict—now, told in the rich, dramatic tones of a master storyteller, this stunning, honor-bound culture is revealed from the inside. To ask other readers questions about The Wandering Falcon, please sign up. how i can i read this book on good reads thers no option? Caroline you cant read this on goodreads. Goodreads is a book REVIEW site,not for free digital books. This is pretty interesting for a novel with no continuous plot and no appreciable character development. It was written by an eighty-year-old man who had a long civil service career in the Federally Administered Tribal Areas around the Pakistan/Afghanistan border. This is where the book is set. The chapters are only loosely connected, giving a broad view of the customs, laws, and lifestyles of the numerous tribes occupying the region. Their values and attitudes are so foreign to the Western mind This is pretty interesting for a novel with no continuous plot and no appreciable character development. It was written by an eighty-year-old man who had a long civil service career in the Federally Administered Tribal Areas around the Pakistan/Afghanistan border. This is where the book is set. The chapters are only loosely connected, giving a broad view of the customs, laws, and lifestyles of the numerous tribes occupying the region. Their values and attitudes are so foreign to the Western mind, it's no wonder we have so little success when we try to meddle in their affairs. Jamil Ahmad's writing is quite accomplished in its simplicity. It often has the quality of stories delivered in the oral tradition, but he adds more detail and nuance. Recent events led me to starting this book, a choice that I now think I should have made ages ago. Then again, an earlier reading would not have resulted in the same breed of appreciation, not while I continued to adhere to the common formula of treating literature and politics as distinct and isolated entities. This is not to say that my interpretation is based on the current flavor of toxic vomit circulating in US media in regards to Pakistan, but rather that I acknowledged its insidious exist Recent events led me to starting this book, a choice that I now think I should have made ages ago. Then again, an earlier reading would not have resulted in the same breed of appreciation, not while I continued to adhere to the common formula of treating literature and politics as distinct and isolated entities. This is not to say that my interpretation is based on the current flavor of toxic vomit circulating in US media in regards to Pakistan, but rather that I acknowledged its insidious existence and stepped around accordingly. I will never be successful at such careful endeavors so long as my country's fetish for war eyes the lands described in this book (indeed I'm likely presuming too much when I consider my ingrained prejudice will stop in accordance with the times), but this work went well enough for me to look forward to more. A single word that comes to mind in conjunction with this work is 'unassuming'. I don't say this in the much abused small-town-Americana or the tiny-village-Britannica senses of the word, but in efforts to describe the exact prose, the mix of mental insight and physical description, and the matter of fact observation of death, madness, and the cruelty of both environment and human being. It would make for a quick read if Ahmad didn't glide over a great deal of the myriad cultures and all their clashes within each of the nine links of stories, spending no longer than was necessary to paint a landscape and/or ideological picture before following his Tor Baz, the Wandering Falcon, on the next leg of his journey. The resulting read is both swift, yet sure. In regards to the low rating, I have my suspicions that people came in for the hysterical badgering of terrorists and those who are popularly known as such in US media for springing out of convenient vacuums. Instead, you will find desert winds of insanity-birthing duration, colonialism, views of World War I in a far less mentioned part of the planet, the brutally jarring alignment of standing cities and migrating tribes, strength, persistence, and a world not as far removed from the United States as its politicians would like to think. Misogyny would be a common indictment of this, but there is a vast divide between the facts of a culture and the mentality of the author, and I did not find anything in the latter that encouraged a hatred of women. As for the selling of others, capitalism does this under the table in far more loftier institutions with the lives of millions and the capital of billions, so it is not something I can judge. In regards to everything else, the author never scorned nor mocked his characters and the ways in which they interacted with the world, so it would not begrudge me to do the same. Jamil Ahmad was a civil servant in the Pakistan Civil Services, and he worked extensively in the hilly regions which serve as the border between Afghanistan and Pakistan (and Iran). These places are mostly inhabited by nomadic tribes who largely play by their own rules - nations and governments mean nothing to them. During his long tenure, Ahmad had the chance to interact with these people extensively, and this book is the result of those interactions. This could be called a picaresque novel - though it would be better to term it a set of connected stories, linked by the character Tor Baz (who is born in the first story and is seen as a young man, maybe in his thirties, in the last). The time period, though not explicitly mentioned, must be the years immediately after the British left the subcontinent. Pakistan as a fledgling state was in the throes of formation, and one can see the bewilderment of these wandering tribes in the sudden appearance of impermeable national boundaries. The novel starts with a couple of refugees reaching a border outpost: they are an illicitly wed couple on the run from the girl's father (who is the tribal chieftain) and her husband, whom she has abandoned to elope with her lover. They ask for asylum, which the soldiers cannot give, as they are forbidden to meddle in tribal matters. They agree to give them shelter, however - their stay drags on for a few years for the woman to give birth to a child, before they are discovered by her father's people. This child (later named Tor Baz) is only an incidental character, just a plot device to connect these tales - in the later stories, his importance diminishes so that he becomes a mere shadow (and that is the main weakness of this book). The tales are actually about the various tribes of this wild region: the Baluchis, the Afridis, the Kharots, the Mahzoods, the Wazirs... and many others; about how these hardy people carry on with their lives in this practically inhospitable region, and the violence and rough justice that is part of their existence. The backdrop of the story is fascinating - however, after the initial chapters, the novel loses steam. The narrative is too jumbled to keep one's interest (the POV shifts to the first person for just one chapter - something I found totally bizarre), and Tor Baz is there just as sort of timekeeper, just to tell the readers that so many years have elapsed since the first tale. And the final two-three chapters were a real let-down: and the ending was totally lame. Jamil Ahmed is a talented writer and a gifted storyteller. He offers rare insight into the remote regions of Pakistan—the tribal belts. Like the landscape itself, the characters portrayed in these short stories are desolate, crude, unyielding and grotesque in their own way. Although these very strange lands are an integral part of my motherland, it pains me to say that I've never visited any of these places, and these very places—with their crude yet riveting beauty—appear to the city dweller a far off dream, a mirage, a tale woven out of The Arabian Nights; such is the plight of the modern, urban man. Jamil had been in the civil services at lucrative posts in these parts, and therefore, his knowledge of the customs of these lands and their topography is insightful, and a rare treat to ignorant readers like myself. Hope does not die like an animal - quick and sudden. It is more like a plant, which slowly withers away. Jamil Ahmad spent most of his life working in the Pakistani Civil Service, a labor that stationed him in several remote territories along the Afghan border. He was also, for a time, posted as a minister to the embassy in Kabul. His long years tending to the concerns of these neighboring countries brought with them a comprehensive understanding and respect for the tribes and traditions he encou Hope does not die like an animal - quick and sudden. It is more like a plant, which slowly withers away. Jamil Ahmad spent most of his life working in the Pakistani Civil Service, a labor that stationed him in several remote territories along the Afghan border. He was also, for a time, posted as a minister to the embassy in Kabul. His long years tending to the concerns of these neighboring countries brought with them a comprehensive understanding and respect for the tribes and traditions he encountered. His experience fostered an ardent desire to set pen to paper - to chronicle what he felt might very well be the waning days of a culture. The Wandering Falcon is his only book, and an elegant achievement of that ideal. Offered through the graceful turns of a fable, Ahmad presents a series of encounters loosely strung around an orphaned boy who would come to be known as Tor Baz (the black falcon). His parents emerge from a sandstorm, barely alive and on the run. His first guardian, the blind leader of a rag-tag group of rebels, falls through his trust in a promise never made. Down come the migratory Afghan highlanders, attempting to bring their herds to winter on the plains. Tradition though this may be, it proves no match for the dictates of a civilizing regime. Slaughter ensues, and a mad mullah, a ritual kidnapping; a Jirga...and ever at each drama's periphery, the wandering Tor Baz. A rich slice of Afghan life - and a reminder that we are, all of us, nomadic by the end. "The Kharot tribe numbered about a million men whose entire lives were spent in wandering with the seasons. 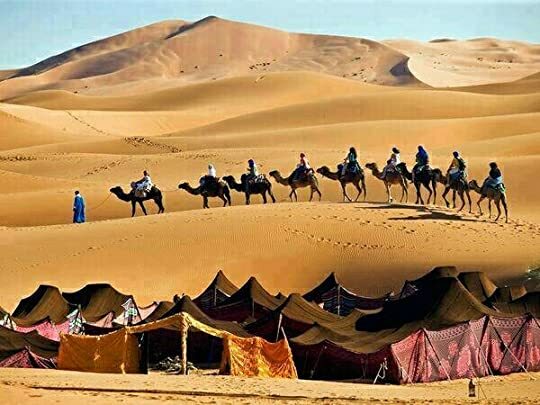 In autumn, they would gather their flocks of sheep and herds of camels, fold up their woven woollen tents and start moving. They spent the winter in the plains, restlessly moving from place to place as each opportunity to work came to an end. Sometimes they merely let their animals take the decisions for them. When the grazing was exhausted in one area, the animals forced them to move on to another site. With the coming of spring they would start back to the highlands, their flocks heavy with fat and wool, the caravans loaded with food and provisions purchased out of the proceeds of work and trading; men, women and children displaying bits of finery they had picked up in the plains. This way of life had endured for centuries, but it would not last for ever. It constituted defiance to certain concepts, which the world was beginning to associate with civilization itself. Concepts such as statehood, citizenship, undivided loyalty to one state; settled life as opposed to nomadic life, and the writ of the state as opposed to tribal discipline. The pressures were inexorable. One set of values, one way of life had to die. In this clash, the state, as always, proved stronger than the individual. The new way of life triumphed over the old. The clash came about first in Soviet Russia. After a few years, the nomad died in both China and Iran. By the autumn of 1958, with the British empire dismantled and the once fluid international boundaries of high Asia becoming ever more rigid, both Pakistan and Afghanistan challenged the nomads. Restraints were imposed on the free movement of the Pawindahs, the ‘foot people’." "The firing was indiscriminate. Men, women and children died. Gul Jana's belief that the Koran would prevent tragedy died too. Dawa Khan fell dead in the raking fire. The Pawindahs made two more attempts, and more camels died each time. After the third try, the Pawindahs started their trudge back. By the time they reached Fort Sandeman, hundreds of dead camels and sheep had fallen by the wayside. By the time they reached the border, most of the animals of the three kirris were dead." তবে সাহিত্য হিসেবে এই একক প্রচেষ্টা স্বার্থক, হয়তো ইউনিক-ও বলা চলে। এই অঞ্চল নিয়ে নন-ফিকশন, মূলত ভ্রমণ এবং ইতিহাস, লিখেছেন অনেক পশ্চিমা লেখক, পিটার হপকার্ক তাদের সবচেয়ে উল্লেখযোগ্য। কিন্তু একদম ভেতর থেকে, এতটা বিশদে জেনেশুনে বালুচ বর্ডারল্যান্ড নিয়ে আর কেউ কোন গল্প-উপন্যাস লিখেছেন বলে আমার জানা নেই - অন্তত ইংরেজিতে। জামিল আহমদের সরল অথচ কাব্যিক গদ্য যেন নির্মম অথচ অপরূপ সীমান্তের মাটি আর মানুষের বিশ্বস্ত প্রতিকৃতি। আনা বাদখেনের ভাষায় - "a language as unhurried and precise as the sparse and iambic landscape they traverse... a beauty that is almost sublime, akin to the beauty his nomads find in the land that nourishes and bedevils them." This is a difficult book to review, although I must say from the start that I truly enjoyed it. If you read it, I have a suggestion. Pretend that you are at a library or an outdoor event, in a group gathered around to listen to a great storyteller. There is tea for everyone and perhaps some dates, nuts, and other little snacks. Then the 80 year old Jamil Ahmad begins to tell strange and wonderful stories about the people of the tribal areas of Afghanistan and Pakistan. He gives some idea of the h This is a difficult book to review, although I must say from the start that I truly enjoyed it. If you read it, I have a suggestion. Pretend that you are at a library or an outdoor event, in a group gathered around to listen to a great storyteller. There is tea for everyone and perhaps some dates, nuts, and other little snacks. Then the 80 year old Jamil Ahmad begins to tell strange and wonderful stories about the people of the tribal areas of Afghanistan and Pakistan. He gives some idea of the harsh landscape and living conditions, but for the most part his stories are about the people he has worked among and understands. Tribal leaders who make their point in meetings through parables, men who treat their animals better than their women, women who nevertheless manage to exert influence on decisions for the tribe, children who know instinctively who to trust. In short, this isn't a novel as you normally think of it. A child, the Falcon, who is 5 years old in the first story is the thread upon which Ahmad weaves his fictional tales. In another story he is 7, then 13, then a young man. He appears in each tale but sometimes only in a cameo appearance. The stories tell about the customs and unwritten laws by which the tribal people of this wild country govern their entire lives. In the cracks and interstices of modern states (Pakistan, Afghanistan, Iran) live people who do and do not belong; nomads and other tribal peoples who negotiate a life with several governments. This short work is a tribute to them, an account of them in concise stories and anecdotes. The slow courtesies of speech; a tribes’ immense tactfulness towards an old chief who has lost most of his eyesight but leads them out in action nevertheless, when obligation calls; this same chief with his antiquat In the cracks and interstices of modern states (Pakistan, Afghanistan, Iran) live people who do and do not belong; nomads and other tribal peoples who negotiate a life with several governments. This short work is a tribute to them, an account of them in concise stories and anecdotes. The slow courtesies of speech; a tribes’ immense tactfulness towards an old chief who has lost most of his eyesight but leads them out in action nevertheless, when obligation calls; this same chief with his antiquated ethic of an uttered word being a pledge, in a court of law that treats his party as bandits and in their eyes, in turn, is rude, inhumane and uncivilized. I am sad to see professional reviews reach for the word ‘brutal’, one after the other, and the worst of them fail to look past the ideas on ‘tribal Afghanistan’ they have brought to this book – fail to notice these elegant turns of mind and speech that he painstakingly portrays. The author wrote in the 70s, in a world innocent of Osama bin Laden or the Taliban; so that if I see another newspaper review telling us these are implicit in the setting or the narrative, I’ll scream. (Because history happens to these people, on the whole; history invades them. This is not a contemporary story, the author says in the interview; haven’t nomads been fettered by states for 2000 years?) Even so, in the 70s, this tribal world was on the brink of extinction; he almost claims so for the Baluch, with an exquisitely-written epitaph; and then there is the story of the nomad people whose ways are shut off one year by the government; it ends with a massacre, and after the massacre, starvation. A few of these tribes live in poverty, either humbly or with an adversarial attitude; a few live well on the milk and fat of their flocks, until the state intervenes. They have relationships with governments home and foreign that go back to the Great Game and WWI, that are as various as the tribes themselves, their lifestyle, their ethics, the behaviour of women. Women play a large part in these stories, from the one who leads that disastrous crossing of an international line, under threat of guns, to those who abandon husbands, for better or worse fates. One important thing – he says this too in the interview – is that he wants to write how different the tribes are from one another. Those unfamiliar lump them together as an age-old cultural world. The stories are not even in quality. Neither is the writing. I felt the three early stories were head and shoulders above the later. Once, just once, I thought he defected from his task, when he made a judgemental, outsider’s statement about the ‘character’ or ‘morals’ of a tribe entire – which is what this lovely book avoids. People have bad stories. A deeply ethical mullah ends violently insane. A girl scores a husband with the asset of a performing bear – wealth and status to her poor family’s eyes; but he is more concerned about his single asset than about her. The author’s aim is not that we universalise these stories (they have cruel husbands – mullahs were odd fish). He took these stories from life, from his experience as an administrator for decades around the tribal areas. He writes of them with respect and lament. Although his ethnographic fiction from the 70s was published to acclaim at the end of his life, he has the sorrow – as he alludes to in the interview I read – of knowing that the tribes, whose near-eradication he complained of then, have not won their battles for existence since. This book gets the distinction of a "one-sitting read". Aside from refilling my whiskey on the rocks, I just couldn't stop. Whichever publisher brought this book to fruition should get a bonus. Everything about it was perfect. Its cover w/ built-in leaf flaps, the uneven page cuts, the coverwork, the size. It's just a cozy book. The voice of this first-time author (at 80 years young) is unique. It is, endearingly, unromanticized or critical of its characters. He narrates tragedies and joys alike, This book gets the distinction of a "one-sitting read". Aside from refilling my whiskey on the rocks, I just couldn't stop. The voice of this first-time author (at 80 years young) is unique. It is, endearingly, unromanticized or critical of its characters. He narrates tragedies and joys alike, with an unemotional "and so it was" detachment. In this instance, the lack of character development worked well, because it is the way in which they live in their wasteland of a world. "You were here. That happened. It sucked. Now we are moving on." Come follow me reader to the next scene. Which leaves the reader, me, free to absorb the strangeness of the world I know nothing about. Learning about new worlds is always a plus in my books, so that's a star right there for it's insider view onto something new. That new world being the harsh plains and ridges of Pakistan and Afghanistan and its nomad tribes...a place seemingly unaware of words like "carefree" or "easy". Obviously my view is hugely skewed by being an American, a woman, and despite my best efforts, subjected to a bias media. I think that is why the writing style worked so well, it was easier to digest the information given because (until the last couple of chapters) my emotions were not engaged and free of emotional pull I could simply go, "hmmm that's an interesting way of doing things,". The book cover leads you to believe that the Wandering Falcon is a character that grounds the book. But it didn't feel that way. It felt more like short stories with related characters that gave you a view of the landscape and it's people. The Wandering Falcon was less a boy/man, and more like the taxi you took to get from place to place. read two or three great reviews for this. The Guardian called it 'one of the finest collections of stories to have come out of south Asia in decades'.. These stories are set on the Afghan/Pakistan border 30 or 40 years ago, before the rise of the Taliban, indeed before the Soviet invasion, more concerned with the aftermath of the British empire (some place names have disconcertingly British names). It gives a great insight into the area - a place ravaged by sand storms (wind rages continuously d read two or three great reviews for this. The Guardian called it 'one of the finest collections of stories to have come out of south Asia in decades'.. These stories are set on the Afghan/Pakistan border 30 or 40 years ago, before the rise of the Taliban, indeed before the Soviet invasion, more concerned with the aftermath of the British empire (some place names have disconcertingly British names). It gives a great insight into the area - a place ravaged by sand storms (wind rages continuously during the four winter months, blowing clouds of alkali laden dust and sand so thick that men can barely breathe or open their eyes), hunger (and thirst) and hardship - and its tribal affiliations, where honour and tradition and tribal rites are of utmost importance. Hospitality is always offered to strangers and negotiation can be won by telling the best story/allegory. Women are sold in the market place and treated worse than bears: Shah Zarina has been sold by her father to a bear trainer and finds that the bear has the best food and accommodation. She could not understand why the bear had to have a room and they could not. Once she asked her husband. He looked at her coldly and said, ‘I can get another wife, but not another bear’. The title character is the orphan of two fugitive lovers (like Romeo and Juliet breaking social barriers to be together) hunted down by their tribes and killed. He is brought up by various nomads and is thus unique and troubling to all because he belongs to no tribe. He appears in a few of the stories as a guide and an informer etc. (An informer is an accepted role in the region, and you can advertise youself as one). The prose is not spectacular, but simple and effective. It doesn't say it's a translation so I assume not - the author was a member of the Civil service posted to the frontier, so probably wrote in English. An absorbing, eye opening read. This book has a very weird format. The weirdest I’ve read yet, because it seems to be composed of disparate short stories, which then link with each other with our protagonist as the common point. And of course other authors have also used this particular format of writing, some with quite a reasonable amount of success, but what’s weird here is that some of these short stories don’t seem to be able to stand on their own, reading as chapters in a larger narrative rather than as a cohesive whole This book has a very weird format. The weirdest I’ve read yet, because it seems to be composed of disparate short stories, which then link with each other with our protagonist as the common point. And of course other authors have also used this particular format of writing, some with quite a reasonable amount of success, but what’s weird here is that some of these short stories don’t seem to be able to stand on their own, reading as chapters in a larger narrative rather than as a cohesive whole on their own. Which means we shift from loosely linked short stories to two or three chapters of one continuing plot, and then back to clearly differentiated parts. That isn’t to say that the reading experience itself isn’t good. I actually really liked this series, with its exploration of the culture of an area of Pakistan that I don’t get to read much of. It is clear that Jamil Ahmad has written from a place of authority and experience: his authorial notes mention the fact that as a member of the Civil Service of Pakistan, he served in the Frontier province and Balochistan area. This exposure shines through in almost all his tales, not so much in the characters than in the tribal culture he describes and the ways in which the people over there live and what they believe. So not only did the stories have a strong sense of being backed up by reality, they also introduced things that I had never heard of, and which frankly sounded a lot like fantasy world-building to me. In the tangle of crumbling, weather-beaten and broken hills, where the borders of Iran, Pakistan and Afghanistan meet, is a military outpost manned by two score soldiers. I hadn’t realized that I had already read the first story in this collection until I got to the third page and recognized it as an entry in Granta’s Pakistan edition. It was possibly one of the best stories in that anthology, and I still remember loving the tale of a couple who eloped and were being hunted. Even though it had such a heart-breaking ending, I really liked the sparse, minimalistic writing style (something I’ve actively been against in my usual reading experience) as well as how true to the story’s narrative the author remained. Jamil Ahmed remains consistent in both his writing style as well as in his descriptions of the rituals and cultures of the pre-talibanised tribal areas in the junction of Pakistan, Afghanistan, and Iran borders that our characters inhabit. The character who survives the first tale, Tor Baz, is the wandering falcon of this series who drifts between all these stories, sometimes as a major player, other times barely a part of the overall narrative. As a kid who is constantly moving from one group of caretakers to another, Tor Baz manages to exist on the periphery of multiple fascinating tales, all of whom blend in together to ensure that various themes get covered. Not only do we have tales which focus on the individual, with themes of love and loyalty and passion, we also see the overall tribal culture, and how it treats matters of honour and honesty. There are soldiers stationed at outposts and whole caravans on the move which face these soldiers, guns and camels pitted against each other. Men and women in these stories are often the bearers of their own fate, with agency and an understanding of their surroundings. With nine short stories which wander from one narrative to another, there were moments when I found myself not really caring what happened to the new crop of characters, especially when some endings felt inconclusive and abrupt. It was at those moments when I felt like I would have preferred that this be a longer tale, one with a cohesive plot and a clear beginning, middle, and end. Thankfully, those moments of irritation were few and far between, and this was primarily because of the author does not attempt to sugar coat anything. He offers no judgement in his writing, taking the role of an omnipresent narrator whose only job is to relay the events without inserting himself into the narrative. This form of storytelling, which offers no critique of the horrible strands of misogyny, cruelty, and oppression within its tales, is not my favourite, and has usually elicited quite strong feelings of anger from my end. Which is why I was quite amazed at how well Jamil Ahmad has managed to distance himself from the story, without alienating the reader. While I prefer that the good defeat the bad and justice triumph over wickedness in my stories, the minimal prose within this short volume of stories prevents just that sort of overanalysing, which meant that I had to take the stories at face value, and rather than decrease their worth, it just added a whole new dimension of fascination to my reading experience. I’d say give this a go purely because very little literature has been produced about the setting which Jamil Ahmad has chosen to write about. It’s entirely possible that there is abundant material in the regional languages of the area, but my lack of fluency in those languages limits me to the material being produced in English and Urdu, and within those languages, Jamil Ahmad is one of the few who has written such an interesting collection of stories set in the tribal areas. Recommended. Loads of really interesting stuff to discuss in here. Review to come. My goodness, I’ve only read two books from the Man Asian Literary Prize longlist and already I’d be hard-pressed to choose between them! According to the bio at Fishpond, Jamil Ahmad is a former Civil Servant who worked in the frontier provinces of Pakistan and also in Pakistan’s embassy in Kabul before and during the Soviet Occupation of Afghanistan. Now living in retirement in Islamabad with his wife, he has – at the age of nearly eighty – gained international recognition with this remarkable d My goodness, I’ve only read two books from the Man Asian Literary Prize longlist and already I’d be hard-pressed to choose between them! According to the bio at Fishpond, Jamil Ahmad is a former Civil Servant who worked in the frontier provinces of Pakistan and also in Pakistan’s embassy in Kabul before and during the Soviet Occupation of Afghanistan. Now living in retirement in Islamabad with his wife, he has – at the age of nearly eighty – gained international recognition with this remarkable debut novel. The Wandering Falcon is superb writing: an elegy for a vanished lifestyle, it will change the way you think about the ‘badlands’ where Pakistan, Iran and Afghanistan meet. These tribal areas today are the focus of global attention because their apparently porous borders facilitate the movement of Islamic militants but Ahmad writes of them in the 1950s long before the rise of the Taliban and Al- Qaeda. The British had departed India in 1947, and Pakistan had been created from Indian and Afghan lands, but these lines on the map meant nothing to the tribes who lived there nor the nomads who travelled freely along traditional routes in search of pastures for their flocks. These people had no concept of nationhood or borders but rather, were antipathetic to each other and fiercely loyal to tribal customs. Ahmad does not romanticise these traditions. The story begins with a couple who have broken the laws of their tribe and have to flee through a harsh landscape to escape retribution. Desperate for food and water, they reach a military outpost in a remote area. Hospitality is obligatory in places where there are no shops or restaurants, but refuge is denied them. The Wandering Falcon is set in what is now considered to be a very troubled and indeed, very controversial area, the Federally Administered Tribal Areas of Afghanistan. Of of these areas, Waziristan, has been in the news for some time due to its fame as a Taliban refuge, but Ahmad's focus is on the numerous tribes who occupied this region prior to modern-day conflicts; he examines how they maintain their ways of life as modernity encroaches on traditional societies. The title character is Tor Ba The Wandering Falcon is set in what is now considered to be a very troubled and indeed, very controversial area, the Federally Administered Tribal Areas of Afghanistan. Of of these areas, Waziristan, has been in the news for some time due to its fame as a Taliban refuge, but Ahmad's focus is on the numerous tribes who occupied this region prior to modern-day conflicts; he examines how they maintain their ways of life as modernity encroaches on traditional societies. The title character is Tor Baz, (Black Falcon) who was born near a military outpost, a "tangle of crumbling, weather-beaten, and broken hills where the borders of Iran, Pakistan and Afghanistan meet," to a couple of illicit lovers from the Siahpad tribe who had run away from their home. All goes well with this family of three until their pasts catch up with them and they are found by their kinsmen and dealt with in accordance to tribal custom. Tor is spared, but abandoned; he is later picked up by Baluch tribesmen, then handed off from person to person and eventually, he simply strikes out on his own. Throughout the book, his travels take him throughout the various border areas, serving as the vehicle through which Ahmad brings his readers into the lives of the different tribes who inhabit this landscape: the Wazirs, Mahsuds, Brahui, the Kharot and the Afridi; there are also the Nasirs, the Dortanis and Baluchs. Along the way Ahmad describes how changes in the world outside of these regions have affected the tribespeople. In one story, for example, nomadic Kharot Powindas ("foot people") have brought their livestock to graze along their traditional wandering routes, but now the border is guarded by soldiers who will not let them pass without proper papers. But these documents cost money and require birth certificates, health documents and identity papers, neither of which the thousands of Kharot possess. One brave woman puts the Quran on her head, banking on the fact that she will be protected, and leads her animals forward only to be fired on by soldiers. As others make the same attempt, they and their animals are mowed down in what will become a massacre. In another, tribes are aligned either with the British or the Nazis during World War II; and in still another, the key guide leading climbers up the Tirich Mir in the Hindu Kush area finds himself with no income and unable to provide for his family once the summit is conquered; his daughter is stolen and later sold into prostitution. "There was a full moon, and it hung half hidden behind the northern cliff. The moonlight was strong and dazzling to the eyes... A long distance away on the mountain crest, he could see small antlike figures silhouetted against its orb. There was a long chain of them moving slowly with loads on their backs. These were the ice cutters." It is very obvious that Ahmad has a deep fondness for the people and the landscape of these areas. He is not critical of the people who inhabit this region; at the same time, he does not idealize them either. Through his eyes perhaps his readers will be able to envision a place, a time, and groups of people before all became synonymous with terror and war. It took Jamil Ahmad eight decades to pen his debut novel about that border place where Iran, Pakistan and Afghanistan meet…a hidden world ravaged by sand storms and hostile inter-tribe relationships. It is knit together through the life of one man – Tor Baz – the eponymous wandering falcon. Tor Baz is the orphan son of a Romeo-and-Juliet pair of lovers who defied the tribal code and as a result, were stoned to death by their tribesmen. He becomes a nomad in an unforgiving environment, where the h It took Jamil Ahmad eight decades to pen his debut novel about that border place where Iran, Pakistan and Afghanistan meet…a hidden world ravaged by sand storms and hostile inter-tribe relationships. It is knit together through the life of one man – Tor Baz – the eponymous wandering falcon. Tor Baz is the orphan son of a Romeo-and-Juliet pair of lovers who defied the tribal code and as a result, were stoned to death by their tribesmen. He becomes a nomad in an unforgiving environment, where the harsh climate, rough terrain, and often brutal tribe justice reigns supreme. To add to the hardships, government officials enforce fixed boundary lines between countries for the first time, ensuring chaos and consternation. After being passed from one “caregiver” to another, Tor Baz grows up to be a confident nomadic wanderer, striving to live peacefully but always the ubiquitous outsider. As readers, we go along for the journey, viewing how these tribes gradually evolve to adapt their cultural practices as borders become more strictly controlled. Although restricted in its scope, this slight book is really universal in its emotions, exploring loyalty and treachery, honesty and bravery, and the support of being part of a clan larger than oneself. After a lifetime of service as a bureaucrat in these terrains, Jamil Ahmad focuses his laser eye on a complex location with its fierce tribal identities. The prose isn’t often magical or haunting; rather, it’s simple and effective and some of the stories shine above others. I recommend this mainly as a way to gain insight into the customs and traditions and tribal anecdotes of a place where little remains secret but much is misunderstood. It's possible that I am so ethnocentric that I don't appreciate the story-telling tradition and style of another culture. Either that, or this book was written terribly. To me it read like a realy choppy and uneven cliff-notes summary. I have no problem with the general device of having the main character of the story appear as a supporting character in each of the stories. In fact, if it were done right, it could turn out very ingeniously interesting and end up revealing a lot about the main ch It's possible that I am so ethnocentric that I don't appreciate the story-telling tradition and style of another culture. Either that, or this book was written terribly. To me it read like a realy choppy and uneven cliff-notes summary. I have no problem with the general device of having the main character of the story appear as a supporting character in each of the stories. In fact, if it were done right, it could turn out very ingeniously interesting and end up revealing a lot about the main character without seeming to. Unfortunately, the execution of this device in The Wandering Falcon fails. The writing is a third person summary narative, which reduces the emotional investment of the reader. Despite this initial problem, the first few stories are done well, and are quite interesting. I was tantalized by the prospects of the book. But the second half of the book, especially the last two stories are flawed. This novel did start on the right track. After I read the first chapter, all I wanted to do was to follow the path of this young child, who was born on an unfamiliar land between strangers he would never see again, and in one cruel moment, he witnessed the death of his parents and was left all alone. I thought episodes of anger, resilience and revenge would follow. However, through the following chapters, I was lost between so many tribes and boarders, poverty and misery, as if starting a new story in each chapter with untied ends. Brutal nature taught these nomadic tribes the art of survival, however, their landscape had to change. The setting of boarders meant also the setting of new values of citizenship and undivided loyalty opposing to their nomadic ways, so their way of life had to die. I think this novel did portray the tribal cultures and nature so well, yet I could not really feel any attachment or anticipation in any of the stories told. Each chapter was just like an individual unfinished story that yet needs to be completed. Imagine late afternoon,the intense heat beginning to dissipate and a delightful langour overtakes you as your camel eases its pace and you gaze through half-shut eyes at the deepening hue of the sky. Don't fall asleep now! Now is an expanded moment in time,but it will change and you need to be alert.You need to pay special attention to the names of the people and places,for they will confound you when they reappear on your path. Above all,don't get lost but keep in mind your place off the map. Th Imagine late afternoon,the intense heat beginning to dissipate and a delightful langour overtakes you as your camel eases its pace and you gaze through half-shut eyes at the deepening hue of the sky. Don't fall asleep now! Now is an expanded moment in time,but it will change and you need to be alert.You need to pay special attention to the names of the people and places,for they will confound you when they reappear on your path. Above all,don't get lost but keep in mind your place off the map. I have taken a number of classes on Afghanistan and Pakistan…it’s history, the people, the culture, the conflict. It continues to come down to a bottom line that these countries are tribal in nature and that unless you understand the tribal culture, you can never understand the country. Because we look at life “through our eyes” it is impossible for someone who is not “inside” the culture to see it in its entirety and to convey it authentically. I was very happy to receive the ARC of the “The Wan I have taken a number of classes on Afghanistan and Pakistan…it’s history, the people, the culture, the conflict. It continues to come down to a bottom line that these countries are tribal in nature and that unless you understand the tribal culture, you can never understand the country. Because we look at life “through our eyes” it is impossible for someone who is not “inside” the culture to see it in its entirety and to convey it authentically. I was very happy to receive the ARC of the “The Wandering Falcon” written by Jamil Ahmad, someone who was very “inside” the tribal culture. Ahmad was a Pakistani civil servant who worked for decades in the Northwest Tribal region. His first posting was in Baluchistan. In 1970, at the urging of his wife, he began to write stories based on his experiences. The result is the fictional account of “The Wandering Falcon,” which is a collection of stories that take place in the mountainous region along the border between Afghanistan and Pakistan. The stories’ characters are members of the nomadic tribes that are in constant flow between the high mountainous areas and the plains, as they take their sheep and goats to grazing areas. They are loosely tied together by the character of Tor Baz, a young boy who was orphaned when his parents, an adulterous couple, were killed according to tribal law when he was 5 years old. He was adopted by Baluch rebels who were fighting the Pakistani government and over time becomes the wandering falcon. The book is small and is an easy read…and I could not put it down. It is stark and it is brutal as it describes the struggles and life of the people, the interactions between characters and the resolving of life’s issues and conflicts according to tribal law. And yet, embedded in the brutality is a beauty and an empathy for the people that creates a sense of humanity in the telling. Tribal law is something that I cannot understand. I was struck with how black and white it is. There are no gray areas. There is a clear dividing line between right and wrong and there is no hesitation in acting according to the dictates of it. Ahmed completed the book in 1973 but no one was willing to publish it until 2008 when two young Pakistani women, a Lahore-based bookseller, Aysha Raja, and a Karachi-based columnist and editor, Faiza Sultan Khan, called on Pakistani authors to submit stories for a competition. Ahmad's younger brother insisted that he must show them his work. After reworking the 35-year-old manuscript, Ahmad sent it to Khan, who championed it, and showed it to an editor at Penguin. (source: Basharat Peer, The Guardian). I am glad that I read the book and while I will never understand how the characters can live as they do and choose as they do, I have a greater appreciation for their life and their struggle. It has also clarified my thoughts and opinions about the Western involvement in this area. I highly recommend the book to anyone who appreciates the beautiful use of words to describe an unknown entity, which Jamil Ahmad did…beautifully! Raw, hyper-real stuff. The Wandering Falcon by Jamil Ahmad mesmerizes you with its spare, elegant prose. In this collection of interconnected stories, we get an unflinching glimpse at the lives of the people who live along the border between Afghanistan and Pakistan: the Kuchi, the Pashtun, the Waziri, and others. It's a world rarely seen in books. There is a hard-edged beauty in the desolation of the landscapes described and the lives we see, but nothing is exoticized. Our Western sensibilities Raw, hyper-real stuff. The Wandering Falcon by Jamil Ahmad mesmerizes you with its spare, elegant prose. In this collection of interconnected stories, we get an unflinching glimpse at the lives of the people who live along the border between Afghanistan and Pakistan: the Kuchi, the Pashtun, the Waziri, and others. It's a world rarely seen in books. There is a hard-edged beauty in the desolation of the landscapes described and the lives we see, but nothing is exoticized. Our Western sensibilities are also never spared. While there is violence, the carnage isn't depicted voyeuristically. When we see a daughter get sold for a pound of opium, or when a man kills his lover to protect her from her vengeful family who chases them across the high desert, or when a woman chooses to be sold to a brothel rather than face humiliation at home—it's never depicted in a sensational way. Ahmad avoids romanticizing tribal life or condemning it. This lack of judgment mirrors the tribes themselves, in the unblinking way they face life and reality—and it's a harsh reality, one of migrations, raids, encroaching modernity. The quality of the writing alone in The Wandering Falcon is worth the read, a throwback to classic storytelling done right. There is a rhythm to the writing that mimics the way the caravans in the stories meander across the hills and mountain passes. Sreca pa se nasao neko dovoljno uporan da natjera pisca da pod stare dane objavi ove price jer mu to isprva nije bila namjera. Tako divno pricanje o tako surovim uslovima zivota na tromedji Irana, Avganistana i Pakistana, predjela odakle su svi sluzbenici bjezali, a Dzamil Ahmad proveo decenije sluzbovanja, upoznao oblast, plemena, jezike, obicaje, i samim tim stekao sve preduslove da citaoca uvede u ovaj daleki, nepristupacni svijet i prikaze neke potpuno nove horizonte. Ein wenig wirr erscheint die Lektüre durch die vielen Perspektivwechsel. Auch die fremden Namen sind ungewohnt, allerdings fand ich es extrem interessant, ja sogar bereichernd, mal etwas aus einem völlig anderen Kulturkreis zu lesen. Nicht alles is gut und angenehm, vieles sogar brutal und unverständlich. Nomadenstämme, die nicht begreifen, warum sie plötzlich einer Nationalität angehören sollen sind aber ein Beispiel für die eher negativen Auswirkungen unserer sogenannten Zivilisation. "These men died a final and total death. They will live in no songs; no memorials will be raised to them. It is possible that with time, even their loved ones will lock them up in some closed recess of their minds. The terrible struggle for life makes it impossible for too much time to be wasted over thoughts for the dead. What died with them was a part of the Baluch people themselves. A little of their spontaneity in offering affection, and something of their graciousness and trust. That, too, w "These men died a final and total death. They will live in no songs; no memorials will be raised to them. It is possible that with time, even their loved ones will lock them up in some closed recess of their minds. The terrible struggle for life makes it impossible for too much time to be wasted over thoughts for the dead. What died with them was a part of the Baluch people themselves. A little of their spontaneity in offering affection, and something of their graciousness and trust. That, too, was tried and sentenced, and died with these seven men." no character building or plot in whole novel (if we can say it a novel). the part i loved was description of my village Tirah . its almost been 9 years since my last visit and i felt nostalgic wandering in pine laden hills through this book ..
"What he told you that day was the secret of life itself. One lives and survives only if one has the ability to swallow and digest bitter and unpalatable things." Divided into nine inter-linked short stories, this book follows the life of the main character, Tor Baz which means the black falcon. Sets in remote lands of Pakistan-Afghanistan borders, the readers will be introduced to many tribes that live, wander and relocate their whole livelihood by following the seasons. It begins with how Tor B "What he told you that day was the secret of life itself. One lives and survives only if one has the ability to swallow and digest bitter and unpalatable things." It begins with how Tor Baz's parent resettled at an army post and later, killed by one of the parent's relative. Then he was taken to live with a head of a tribe who then gave him away to another mullah from another tribe. In each of the chapter, readers would be served with stories from different tribes with some connections to the main character who appears on the fringe. The author has written this book in a prosaic, matter-of-fact style with great respect and compassion towards the tribes' lives. He acknowledges how wearying their lives could be every time they wander and move around. Some stories shown how government treated these tribes atrociously, pushed them to obey political command to the point of killing them. As a reader, this book makes me wonder and question. How true this fiction actually is? Do these tribes still exist? It surely opened my eyes to what little I have known and exposed me to the disappearing tribes and their lifestyles. Most of what I know about the part of the world where Pakistan and Afghanistan meet is through Kipling's The Man Who Would Be King. So you know I don't know much. But I do know that when Daniel Dravot and Peachy tried to use their guns and wits to conquer the tribes in this mountainous, inhospitable region, the tribal culture initially worked for them, then against them. This view of tribal culture, in which the individual may endure but does not achieve dominance, is but one of the conclusions re Most of what I know about the part of the world where Pakistan and Afghanistan meet is through Kipling's The Man Who Would Be King. So you know I don't know much. This view of tribal culture, in which the individual may endure but does not achieve dominance, is but one of the conclusions reached reading another book that takes part in that high corner of the world. Jamil Ahmad, at age 80, published his first work last year with The Wandering Falcon after spending years in the area. It isn't quite accurate to call The Wandering Falcon a novel. It is part fable, part character study of a way of life rather than one singular character and part a setting down in writing tales that have probably been told there for years. There is a man in the book who is a wandering falcon. His parents are unfortunate lovers; she's the daughter of a tribal leader and he's a nobody. They ran away together, finding refuge for several years near an army fort. When her father's people eventually find them, the outcome is not good. Their child, the falcon of the story, survives. He's passed from mentor to mentor over the years. What he learns and how he became what he did is not told, however. He disappears for pages and pages. But in between those appearances, the various stories provide a few clues as to how the people of the region may view life. The General once again adjusted his cloak, and his son felt a stabbing pain as he realized that within the last few minutes this garment, which had signified grandeur, pride, and strength, had become an ordinary covering for an old man seeking to hide his mind and body. "We allow the right to make and unmake chiefs only to ourselves. We do not accept the power of anyone else to decide who our chief shall be or shall not be. That is the cause, and we cannot help but fight for such a cause. Indeed, it is a cause of conscience." "Conscience!" the old man's voice broke in. "Jangu, do not talk to me of conscience. What kind of a guide is it when it comforts the evil man in his labors no less willingly than another who struggles against wrong. Never have I seen a man truly troubled by his conscience. Conscience is like a poor relation living in a rich man's house. It has to remain cheerful at all times. It has to remain cheerful at all times for fear of being thrown out. Our cause is right, because we think it is right -- but never depend on conscience, yours, or another man's." Although the first man's statement confirms to me why national governments and tribal chiefs don't co-exist in one unified form of government, the old man's comment led me elsewhere. I couldn't help but think of the election and our GOP opponents while reading this. What he told you that day was the secret of life itself. One lives and survives only if one has the ability to swallow and digest bitter and unpalatable things. We, you and I, and our people shall live because there are only a few among us who do not love raw onions. As bitter as life is for the menfolk, it's worse for the women. They are property to be kidnapped, sold for a pound of opium, to be treated worse than a bear that does tricks. In all these stories within the book, the boy who is known as the falcon either does not appear or makes only a brief appearance. He could be likened to a bird that views the actions of these characters from a distance and without passion. Fables have no use here. They are not evidence. Can a fable explain a death? Of course a fable can explain a death, a way of life and the dying of a way of life. Which is, perhaps, more to the point of The Wandering Falcon than anything else. Like many great novels, The Wandering Falcon is as much a story of a people as it is a story of a person. I’ve always wondered about the tribal regions at the borders of Iran, Pakistan, and Afghanistan. What is it that makes governance so complicated in those regions? Who are the people that live there? The Wandering Falcon tells a story from that region, and in the process, tells the story of the region--or at least part of it. 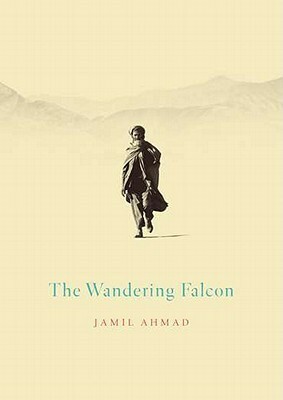 Written by seventy-year-old Jamil Ahmad, The Wandering Falcon is spa Like many great novels, The Wandering Falcon is as much a story of a people as it is a story of a person. Written by seventy-year-old Jamil Ahmad, The Wandering Falcon is spare in its language and quick in its movement--but full of the details that make stories vivid. Chapters move briskly, and characters enter and exit the action of the story with the brevity familiar to anyone accustomed to life on the road. It is unsentimental while still probing deep and moving relationships. Whether this is a writing style or a cultural characteristic (or both) isn’t entirely clear. The landscape is mountainous and similarly spare, and life in the novel is uncomplicated by the trappings of modernity--in part because it is set in the post-WWII, mid-20th century and in part because life in the tribal regions, this novel suggests, was a nomadic life, untethered by urban and suburban infrastructural utilities and supply routes. But this does not mean that the characters’ lives are uncomplicated. The relationships are as complex as any: between people and people, people and tribe, tribe and tribe, tribe and government, and government and government. The story of Tor Baz, the main character, is the throughline between these relationships, and, stretching from his birth to early adulthood, it is one of openness, discovery, honor, love, tragedy, and optimism. Tor Baz is the best kind of guide, even-keeled and adaptive, and Ahmad’s narrative reads like storytelling; perhaps it Ahmad’s voice, simple and sage, that lends Tor Baz his easy character. The Wandering Falcon is not perfect--it reads like a collection of short stories with a recurring set of characters--but it is unfailingly vivid, and anyone with any experience in the desert or in the Middle East will fondly recognize many of the novel’s depictions of people and place. Do I recommend it? Yes. It is short, crisp, and every sentence paints a picture. Would I teach it? I’m not sure. It doesn’t fit in the context of my current classes, but it seems a valuable source for exploring how to depict character. I was pleasantly surprised to have really enjoyed this book. It's a small book, but each story had quite a key impactful plot, which also gives you another layer of the zone the whole book is situated. The Wandering Falcon is a chance to showcase the daily lives of nomads and communities around the borderlines between Pakistan, Iran and Afghanistan. It does follow the life of one character Tor Baz, but not as the main character. He comes in and out of each chapter, in some of them more strongly t I was pleasantly surprised to have really enjoyed this book. It's a small book, but each story had quite a key impactful plot, which also gives you another layer of the zone the whole book is situated. The Wandering Falcon is a chance to showcase the daily lives of nomads and communities around the borderlines between Pakistan, Iran and Afghanistan. It does follow the life of one character Tor Baz, but not as the main character. He comes in and out of each chapter, in some of them more strongly than others. He is born in the first chapter to parents who are running away. He then becomes a lost boy where other man take responsibility of looking over him. In the meantime, the author gives us more laborious stories around the characters that Tor Baz comes across directly or indirectly. If one of the functions of literature is to develop empathy, this book is great literature. A beautiful and insightful glimpse into a little-understood - but much discussed - region of the world. Ahmad writes what he knows, seemingly without judgment; his prose seems to perfectly accompany any of the hundreds of photos from the Pakistan-Afghanistan border that one calls to mind from the last 60 years. He narrates the life of the tribesmen and women from this isolated land in a way that does not s If one of the functions of literature is to develop empathy, this book is great literature. A beautiful and insightful glimpse into a little-understood - but much discussed - region of the world. Ahmad writes what he knows, seemingly without judgment; his prose seems to perfectly accompany any of the hundreds of photos from the Pakistan-Afghanistan border that one calls to mind from the last 60 years. He narrates the life of the tribesmen and women from this isolated land in a way that does not simplify it or make it any more familiar, but makes it...seen. Which is really quite a feat. Jamil Ahmad was one of the few English writers of Pakistani origin to have garnered attention outside his country. Though his body of work was small and limited to one book, the Wandering Falcon and a short story, The Sins of the Mother, he is considered as a major writer among Pakistani writers of English fiction. Jamil Ahmad was born in Punjab, in the erstwhile undivided India, in 1931. After ear Jamil Ahmad was one of the few English writers of Pakistani origin to have garnered attention outside his country. Though his body of work was small and limited to one book, the Wandering Falcon and a short story, The Sins of the Mother, he is considered as a major writer among Pakistani writers of English fiction. Jamil Ahmad was born in Punjab, in the erstwhile undivided India, in 1931. After early education in Lahore, he joined the civil service in 1954,and worked in the Swat valley, a remote Hindu Kush area, near Afghan border. During his career, he worked at various remote areas such as the Frontier Province, Quetta, Chaghi, Khyber and Malakand. He served for two decades among the nomadic tribes who inhabit one of the world’s harshest and most geopolitically sensitive regions. With his mesmerizing and lyrical tales, Ahmad illuminated the tribes’ fascinating attitudes and taboos, their ancient customs and traditions, and their fiercely held codes of honor. He also served as the a minister at the Paksitani embassy in Kabul during the Sovient invasion of Afghanistan in 1979.